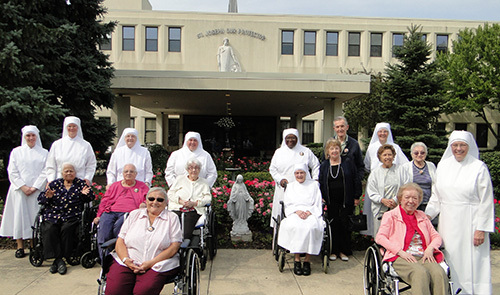 Early in our community’s history a group of townspeople who witnessed the Sisters’ humble charity toward the elderly dubbed them the “Little” Sisters of the Poor; the name stuck. Recently, however, we have become known to some as “the HHS Sisters” due to our lawsuit against the federal government over the HHS Contraceptive Mandate. This issue has been pursuing us for over three years — pushing us out of our quiet, hidden lives into the unwelcome glare of the public eye — and there is no end in sight as our case now heads to the U.S. Supreme Court. Why us? When will this journey end? I recently wondered as I prepared for yet another media interview about the case. But then a prayer attributed to Salvadoran martyr Archbishop Oscar Romero came to mind: “It helps, now and then, to step back and take a long view … We lay foundations that will need further development … It may be incomplete, but it is a beginning, a step along the way, an opportunity for the Lord's grace to enter and do the rest. We may never see the end results, but that is the difference between the master builder and the worker. We are workers, not master builders; ministers, not messiahs. We are prophets of a future not our own." Stepping back to take the long view helped me to answer the question, “why us?” Perhaps, among religious communities serving in the United States, we are uniquely qualified to face our nation’s current threats to religious liberty. Our foundress, Saint Jeanne Jugan, was born at the height of the radically anti- Christian French Revolution and established our congregation in its tumultuous aftermath, with virtually no resources. 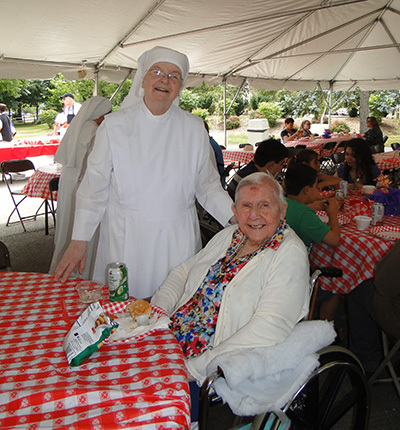 By the time her earthly journey ended her young community had grown to over two thousand Little Sisters serving the elderly in nearly a dozen countries. Today we are present in thirty-one nations. Saint Jeanne Jugan was undoubtedly the prophet of a future not her own. Based on our humble beginnings we might say that the will to persevere in serving the poor and bearing witness to the Joy of the Gospel despite seemingly insurmountable obstacles has been written into the DNA of our Congregation. 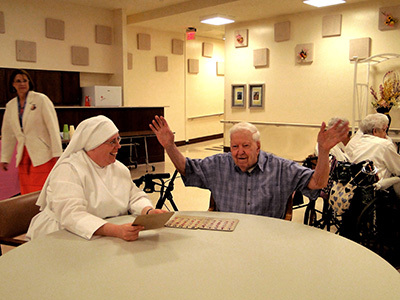 Generations of Little Sisters have soldiered on through two World Wars, civil wars and government persecution of religion in numerous countries around the globe, disregarding their own personal safety in order to stand by their residents. Others have weathered earthquakes, tsunamis and natural disasters of all sorts. By God’s grace they faithfully remain beside of the elderly regardless of dangers or harsh conditions. Taking the long view I’ve come to a new appreciation of the power of God’s Providence. He has never abandoned us and I am confident that he will not leave us orphans in this challenging moment of our history. Could it be that God is taking our HHS journey all the way to the Supreme Court to give us the opportunity to witness to our absolute confidence in his loving Providence? Could it be that God chose us for this struggle in order to underline the dignity of every human being created in his image and likeness? God’s modus operandi is to use the weak of this world to confound the learned and the strong — What weaker or more unlikely prophets could he have chosen to confuse the great and powerful of our contemporary culture than Saint Jeanne Jugan, her Little Sisters of the Poor and the needy elderly? God’s mercy is from age to age on those who fear him; the Almighty will do great things for us — I’m sure of it!